Verde has already been adopted by DataFarming, an Australian agtech company based in the regional city of Toowoomba, Queensland, delivering precision agriculture solutions for farmers and agronomists around the world. Verde is a solution powered by OneAtlas, the digital platform of Airbus Defence and Space Intelligence. François Lombard, Head of Intelligence Business at Airbus Defence and Space, said that with Verde, the company underlines the ambition to become the reference layer for precision agriculture portals. Both leveraging the company's wide imagery harvesting and the firm's unrivaled crop analysis capacities, the company is offerihng a totally different way to derive agronomic information from satellite imagery. Tim Neale, Managing Director of DataFarming, said the company is looking at expanding the firm's product offering to the 7,500 farm user base who want more detail about the crop, beyond just NDVI. Having higher resolution on some of the data is also a key value proposition. This is where VERDE fits quite nicely. 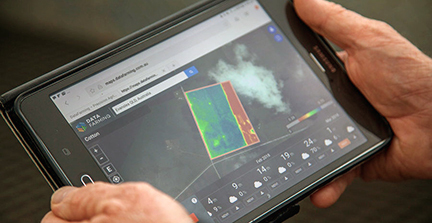 DataFarming has already processed 4,000,000 hectares of NDVI to date, and want to leverage the firm's user base to offer this value added service. Crops such as cotton, rice, and sugarcane will certainly benefit.